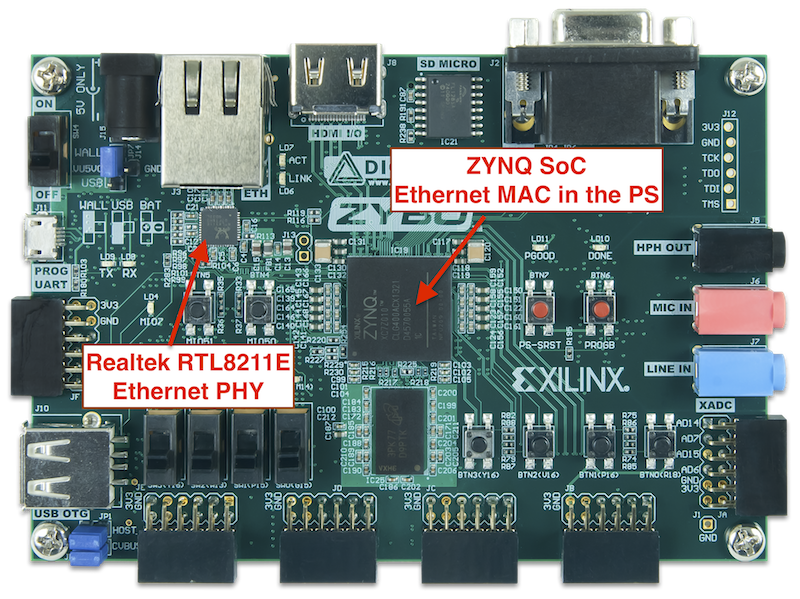 This tutorial explains what is necessary to make the Ethernet interface of the ZYNQ SoC functional in the Zybo board. It also provides a brief overview about the basics of Ethernet that we need in order to understand what we are doing. Although the tutorial adopts the ZYBO board, it is expected to be informative to anyone developing for the ZYNQ (regardless of the board). Along the tutorial, the [ZynqManual] will be referred many times, so make sure you have it readily open for consulting when necessary. In the end, please feel free to ask questions or leave comments. Once we know where the MAC and the PHY layers are, the next step is to understand how they communicate to each other. 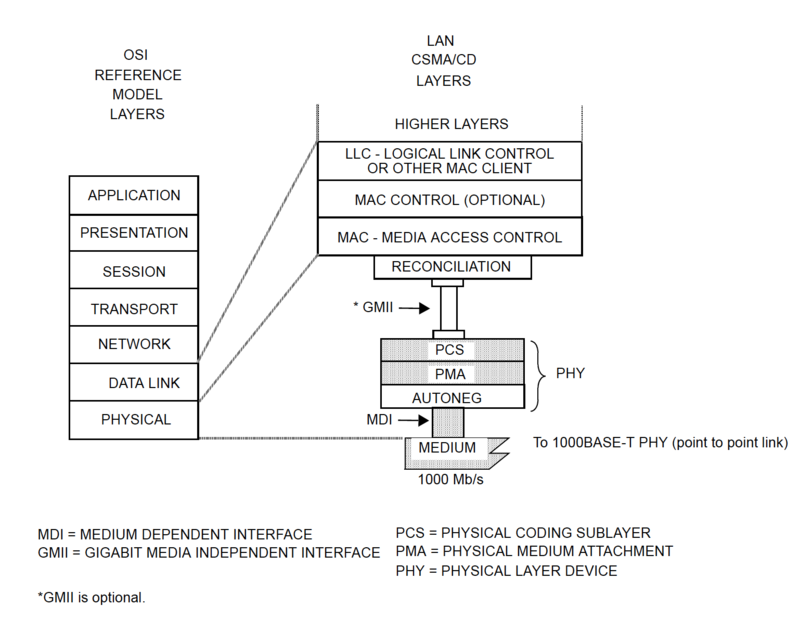 As the diagram below shows, the communication between the MAC and PHY layers can be made through several different flavors of an interface called “Media Independent Interface” (MII). One of them is the so-called Gigabit Media Independent Interface (GMII) that is shown. Other options are, for example, the Reduced GMIII (RGMII), which requires half the number of data pins with respect to the GMII, and the Serial-GMII, which requires even less, only 4 differential outputs: Tx data, Rx data, and the two corresponding differential clocks, as described in [SGMII]. We, therefore, must first understand which interface our MAC can provide and which one the PHY chip expects. 1000BASE-T PHY sublayers and their relationship to the ISO Open Systems Interconnection (OSI) Reference Model, from IEEE 802.3 Clause 40. It turns out that the MAC implemented in the PS part of the ZYNQ connects through an RGMII interface that is routed across the Multiplexed Input/Output (MIO) interface of the ZYNQ PS. Additionally, it can provide a GMII interface through the EMIO (if you are not familiar with the EMIO, check the ZYNQ manual, it is when PS peripherals are routed through the PL). The difference in the interface comes from the fact that the MIO is more limited in the number of available IO pins, so it makes sense to not occupy it with the high pin count of the GMII and instead use the RGMII (reduced GMII). The reason why a GMII interface can be availed to the PL is because some applications may need to instantiate some PHY sublayers within the PL. For example, if the goal is to implement a SGMII interface between the MAC of the ZYNQ PS and an external PHY, then we would need to implement an IP called “PCS/PMA or SGMII core” in the PL (and this would be possible only on FPGAs that have gigabit transceivers). This IP, in turn, would be configured in the SGMII bridge mode, as described in [PCS/PMA]. But don’t worry about this now, since we won’t need it. The Realtek RTL8211E-VL PHY flexibly accepts both GMII and RGMII interfaces for 1000BASE-T operation. And by the way, if you don’t know what 1000BASE-T is, it is just a name for an Ethernet interface capable of 1 Gbps data rate and that communicates through the well known twisted-pair copper cables. Now, since an RGMII interface is availed through the ZYNQ MIO (in the PS part of the ZYNQ), we are ready, that is, we don’t need anything in the PL to make the MAC talk to the external PHY chip. The RGMII interface in the MIO already suffices. At this point, we know where the MAC and PHY layers are implemented and how they are going to communicate to each other. However, there is still one missing interface, the one through which the MAC sends and reads configurations to and from the PHY. This interface is called the Management Data Input/Output (MDIO) interface, and is accompanied by the Management Data Clock (MDC). It merely consists of two extra pins (one for each) that we need to connect to the PHY. The PS provides these outputs from the MIO too, and they are routed to appropriate pins (connected to the PHY) in the ZYBO board. So, yes, we are ready! In summary, the previous section explained that we use the hard MAC of the ZYNQ SoC, connect it to the external PHY through the RGMII interface of the MIO and manage the configuration of this PHY chip through the MDIO. Now, the question is, how are we going to send a receive data through this Ethernet interface? As explained in the [ZynqManual], the MAC Transmitter and Receiver modules (in the PS) are connected to a FIFO, which, in turn, exchanges data with memory through a DMA controller. When transmitting, data is first fetched from memory and written into this FIFO, then the FIFO passes this data on to the MAC Tx chain. In the opposite direction, the MAC Rx writes the received data in to the FIFO, and the DMA sends this data to memory. This is depicted below in the diagram of the Ethernet controller. The operation of the DMA is detailed in a dedicated post. For now, we can advance into the hardware design and concentrate on the Ethernet configuration. The following steps create a simple hardware design that is sufficient for experimenting with the Ethernet interface in the ZYBO board. 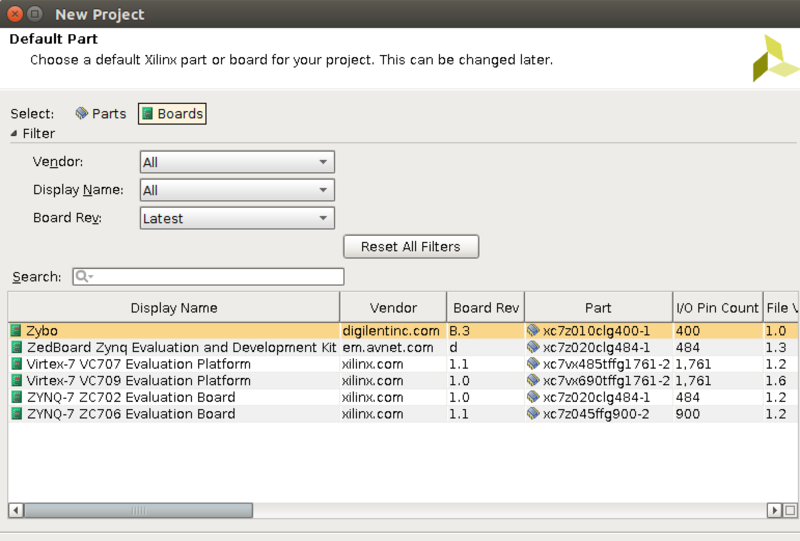 In the “Default Part” dialog, set the Zybo board, as shown below. If the Zybo is not listed, make sure you include the Zybo board configuration file. It is not straightforward to find this file, but you can find it in one of the Zybo tutorials at the Xilinx University Program (XUP). Select the Zybo as the project board. Add the ZYNQ Processing System IP. Figure 4. 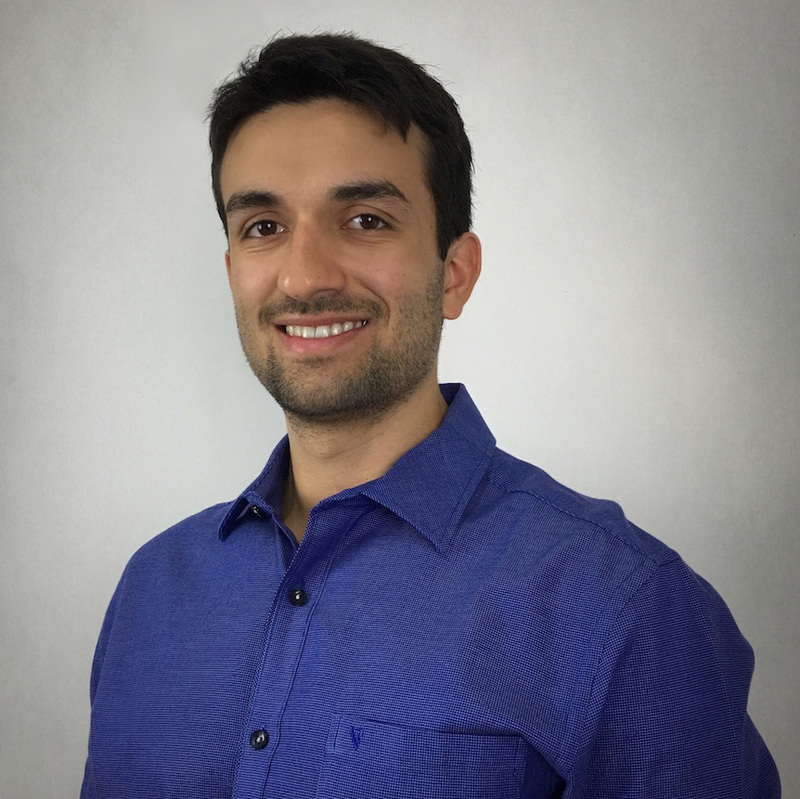 ZYNQ block automation. ZYNQ Block Design with Ethernet enabled. Note that the RGMII interface, MDIO and MDC pins are routed through the ZYNQ MIO towards the External PHY, as seen below. 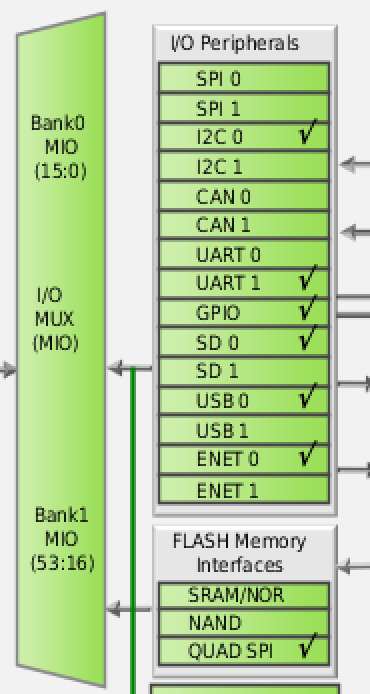 ZYNQ MIO Configuration for the Ethernet interface. 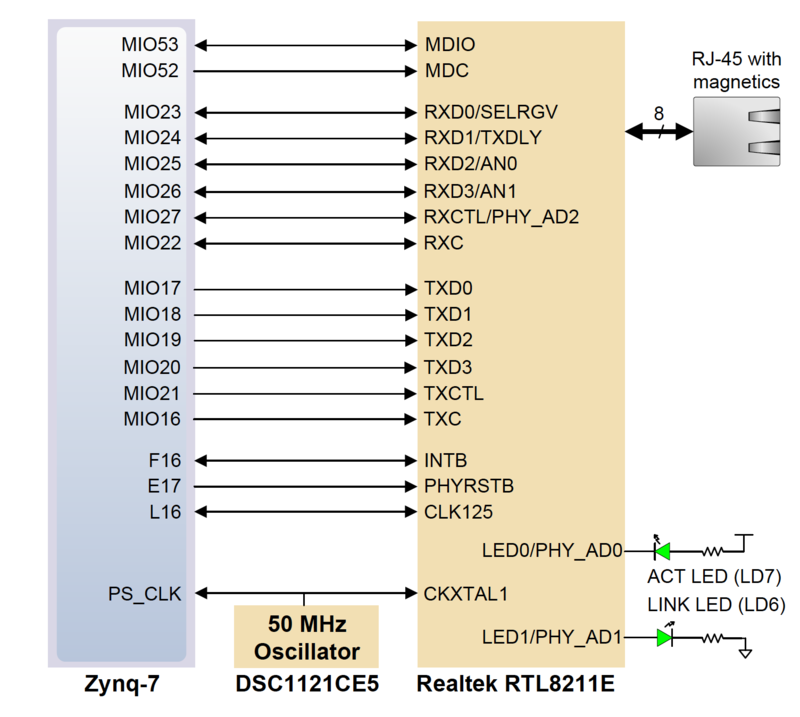 Signal connections between the ZYNQ MIO and the Realtek PHY chip. Taken from the Zybo Manual. Go to the PS-PL configuration pane. Expand “AXI Non Secure Enablement -> GP Master AXI Interface” and disable the AXI master interface 0, which we will not used (and was added through the preset configuration). (File -> Export -> Export Hardware). In case you don’t know, include the bitstream only in case you prefer to program via the SDK. I normally prefer to program through the Vivado Hardware Manager, so I leave this option unselected. With the SDK open, create a Board Support Package (File -> New -> Board Support Package). The default configuration is okay. After creating the BSP, the system.mss file will be opened. Then, go to its “Peripheral Drivers” section and find ps7_ethernet_0. Then import the “intr_dma” example. Now, the remaining part is to understand the “intr_dma” example application and use it to test the system. In the sequel, an overview of the application is provided, with focus on the Ethernet configuration. Conventionally, Xilinx drivers for Ethernet MAC (EMAC) IPs normally start with functions like the XEmacPs_LookupConfig and XEmacPs_CfgInitialize. The first essentially reads information of the hardware defined in the Vivado project from the xparameters.h file (exported to the SDK project) and returns this information in an organized structure. In the current case, the most important information is the address to which the EMAC is mapped on memory. After this information is obtained, the second function (XEmacPs_CfgInitialize) initializes a structure of type XEmacPs that contains the EMAC configurations, with all default values and including the particular address obtained from the first function (XEmacPs_LookupConfig). This structure will, then, be used whenever a configuration is to be written to the EMAC. The next thing that the example application does is to configure the Ethernet Tx clock through the so-called System-Level Control Registers (SLCRs). This is done by configuring the GEM0_CLK_CTRL register such that a 125 MHz clock is provided to the MII, where data is transferred at 8-bit per cycle (125 * 8 gives 1Gbps, as required). And to do so, first the SLCRs have to be unlocked by writing to the ZYNQ register called SLCR_UNLOCK, then, after configuring the two registers, the SLCRs must be locked back. This is a standard procedure every time one of the SCLR registers needs to be configured. Now let’s advance to the most important part of this tutorial, the configuration of the PHY. The following steps will be essential to make the Ethernet interface functional in the ZYBO board. The subsequent lines put the PHY in loopback mode (so that frames are not sent over the twisted-pair line), reset the PHY and configure the speed to 1Gbps. However, for the purpose of this tutorial, we do not want a loopback. Instead, we want to check that the frames are effectively sent over the Ethernet cable, by inspecting them in the link partner (in my case the computer). Hence, the loopback mode will be disabled. To disable the loopback mode and for other things soon to be explained, the next steps consist in interactions with the so-called MDIO registers, so it is worthwhile to present some background. As explained before, the MDIO is a serial bus that allows the MAC to manage the PHY. In particular, it does so by allowing the MAC to read and write to (from) a set of management and status registers in the PHY, among which there are both standard registers and vendor-specific registers. where PhyAddress is the address corresponding to the PHY that is targeted (there could be multiple PHYs, e.g. in a switch), RegisterNum is the number of the target MDIO register to be read or written and PhyData holds the read value or the value to be written. * Adding Tx and Rx delay. Configuring loopback speed. You can remove all of these lines, because they are not valid for the specific PHY that we are using. If interested, you could verify that by looking into the Realtek RTL8211 datasheet and searching for the above registers. You would see that they do not exist. Apparently, the example application was developed for a Marvell PHY (probably the 88E1116R of the ZC706 board). and a declaration of u16 PhyReg1 must obviously be added before the function. Once the wait is completed, the application could read the content of MDIO Register 5 to obtain the negotiated configuration and properly configure its local PHY. Nevertheless, here it suffices to only wait for the completion. Besides, it should be noted that if the above does not work (the auto-negotiation never completes), it is probably because the auto-negotiation is not enabled. Make sure you enable it within the Register 0 (bit 12). That concludes the configuration. Now you are ready to test. To test the application, simply plug an Ethernet cable between your computer and the ZYBO board. Launch Wireshark, start a capture in the Ethernet interface card that was connected to the ZYBO board and run the application in the SDK. Wireshark is expected to receive the frame transmitted by the Zybo board. That concludes the tutorial. Please, feel free to leave comments or questions. [ZynqManual] Zynq-7000 All Programmable SoC – Technical Reference Manual. UG585 (v1.11) September 27, 2016. [SGMII] Chu, Y. C. (2001). Serial-GMII specification. Revision, 1, 3.